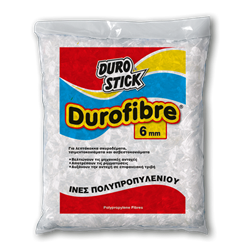 Durofibre, polypropylene fibres (PP) constitute an improving additive for concrete, cement and lime based mortars. Their addition creates a three dimensional matrix, which functions as reinforcement that prevents the formation of hairline cracks (cracking) during the curing process. Fibres in concrete improve its resistance to impact and abrasion, as well as its cohesion while pouring. They combine perfectly with Durostick improving emulsions and plasticizers. They are not affected by alkalis or acids. Their addition during the concrete homogenization process, will not damage the internal parts of mixing and pumping machinery. Note: The addition of Durofibre 6mm presents better results when the aggregate is less than 10mm, especially in thin layers of premixed or traditional cement mortars. From 900-1.200gr/m3, depending on the demand of the reinforcement.